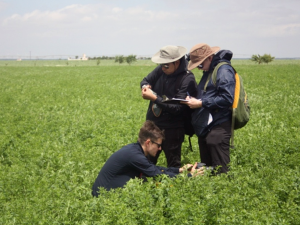 Luke Brown, Julio Pastor-Guzman, and Harry Morris of the University of Southampton measure canopy chlorophyll content in an alfalfa field. 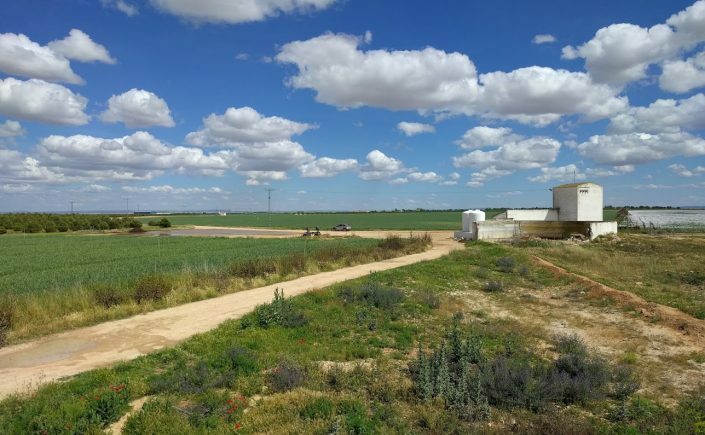 Scientists from the National Physical Laboratory (NPL), University of Southampton, EOLAB, and the European Space Agency (ESA) travelled to the Barrax – Las Tiesas experimental farm on 1st June, in preparation for a week-long campaign. The campaign, the first of the FRM4VEG project, aimed to provide data to support validation of Copernicus products from Sentinel-2, -3 and PROBA-V. 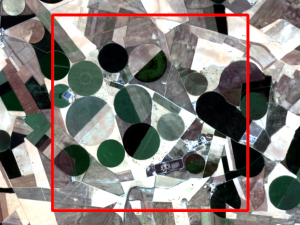 Located near Barrax in Castilla-La-Mancha, Spain, the site has been the previous focus of multiple ESA-funded campaigns, and was selected due to its typically clear skies, flat terrain, and well-managed crops. 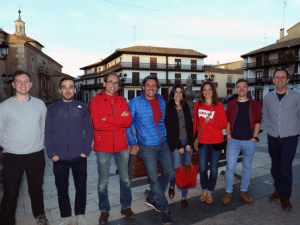 After a successful campaign kick-off meeting hosted by the University of Castilla-La-Mancha (UCLM) in Albacete, the teams set out to begin data collection on the morning of 2nd June, led by Dr. Fernando Camacho de Coca of EOLAB, who has extensive experience working at the site. Harry Morris (University of Southampton), Niall Origo (NPL), Dr. José González Piqueras (UCLM), Dr. Fernando Camacho de Coca (EOLAB), Lorena de la Madrid Descalzo (EOLAB), Dr. Valentina Boccia (ESA), Luke Brown (University of Southampton), and Dr. James Ryder (NPL). Throughout the week, the teams from EOLAB and the University of Southampton carried out measurements of biophysical variables, focusing on two key parameters that describe the health of vegetation: the fraction of absorbed photosynthetically active radiation, and canopy chlorophyll content. Meanwhile, the team from NPL concentrated their efforts on measurements of surface reflectance, the fundamental quantity upon which satellite-derived biophysical variables are based. Measurements of the biophysical variables were conducted in elementary sampling units of 20 m by 20 m, enabling them to be directly related to data from Sentinel-2’s Multispectral Instrument (MSI). By the end of the campaign, 52 elementary sampling units had been characterised, covering 7 different crop types (alfalfa, garlic, rapeseed, spring onion, sunflower, poppy and wheat), in addition to a number of bare soil areas. Sentinel-2A MSI true colour composite acquired on 13th June (site shown in red). Contains modified Copernicus Sentinel data 2018. Despite persistent cloud cover throughout the campaign, conditions improved the following week, during which cloud-free Sentinel-2 and -3 overpasses were made. Given the stability in vegetation conditions at the site, the data acquired during these overpasses will prove useful, both for upscaling and product validation. Nevertheless, the cloud cover hampered the collection of surface reflectance measurements, which require stable illumination and coincidence with the satellite overpass. As a result, a follow-up campaign is set to take place in July.